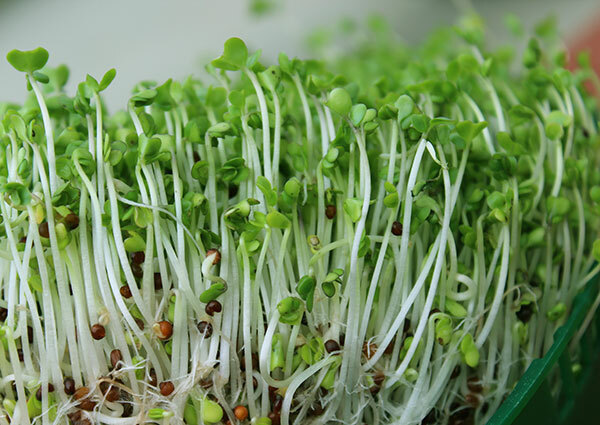 Broccoli sprouts, sprouted from broccoli seeds, are a nutritious sprout variety first used in the 1970's, along with other sprouts, like alfalfa and wheatgrass. Although incorporated as a dietary food source among health-conscious communities around the world, it wasn't until the early 90's that the sprouts became popular amid a more mainstream audience. In 1992 researchers from John Hopkins University in Baltimore discovered that broccoli, as well as other cruciferous vegetables, contained a substance referred to as glucoraphanin, a precursor to the natural antioxidant and detoxifying isothiocyanate called sulforaphane (SGS) believed to be a anticarcinogen. It wasn't until 1997, however, that broccoli sprouts made news article headlines in the New York Times when studies (*) reported that the sprouts potentially comprise between 30-50 times more glucoraphanin than the mature broccoli head. Essentially the fresh sprouts were shown to offer an alternative to consuming the pounds of broccoli you would have to eat to get the same health benefits. 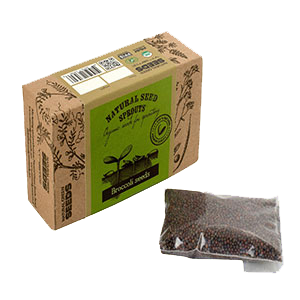 As word got out that broccoli sprouts were one of the top healthiest sprout varieties to consume, demand for the seeds for home and commercial sprouting created a temporary global shortage and subsequently increased the price over other types of sprouting seeds in future years. Rarely are broccoli sprouts found in stores these days, but are occasionally available at farmers market stands or grown by local small scale sprouting business'. 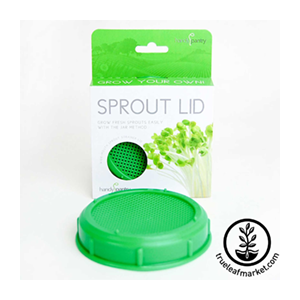 As a result, many people who love the taste and health enhancing benefits of the sprouts, usually grow them at home from the seeds as a microgreen or as a jar sprout variety. Growing them is quite easy with a few simple supplies and, of course, high quality organic broccoli seeds. 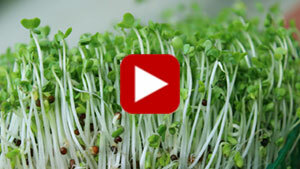 What Do Broccoli Sprouts Taste Like? If you like the taste of other more neutral tasting sprouts and you've never had broccoli sprouts before, you are in for a treat. They have a delicious nutty flavor that some people liken to the taste of radish minus the spiciness. Broccoli seeds are often used in sprouting seed mixes to add to the bouquet of flavors that work well with other sprouts, like onion, alfalfa and fenugreek. 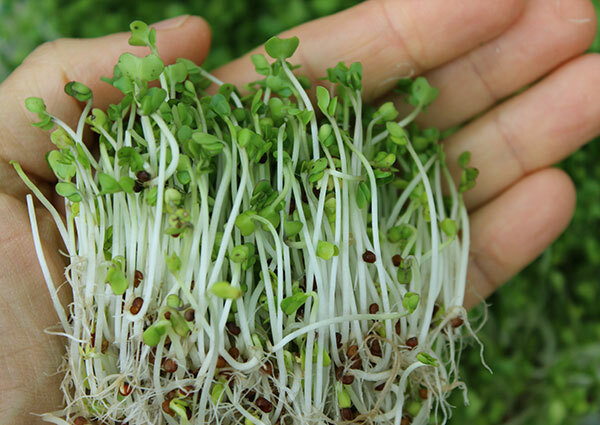 Broccoli sprouts look similar to alfalfa sprouts but usually have a darker green color. Broccoli seeds themselves actually have substantially high levels of glucoraphanin, but additionally contain the antimetabolite erucic acid which inhibits its absorption if consuming the seeds directly. 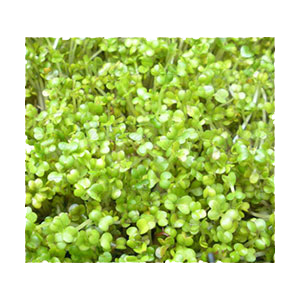 This acid is broken down during the sprouting process, in turn making the sprouts a viable source of this sulforaphane-producing antioxidant compared to the seeds or the more mature versions of the plant. When the cellular structure of the plant is broken by chewing and ingesting the sprouts, a chemical reaction occurs whereby myrosinase and glucoraphanin interact to produce sulforaphane. Sulforaphane is the key nutrient studied for its health-enhancing potential and is activated through this chewing process. The immune enhancing constituent sulforaphane or SGS found in broccoli sprouts is one of the phytochemical groups of isothiocyanates common in some of the cruciferous vegetables in the Brassica genus. Out of all the vegetable sprout crucifers, sprouted broccoli seeds are found to have the highest concentrated amount of glucoraphanin and sulforaphane after it is ingested and broken down by the enzyme myrosinase. 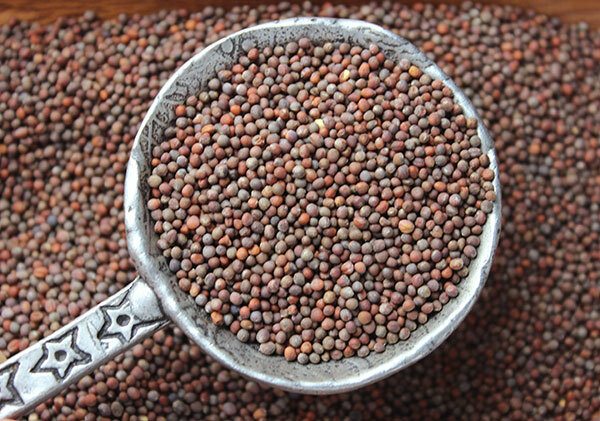 To a much lesser degree sulforaphane can also be obtained by consuming sprouts or vegetables like kale, mustard, kohlrabi, radish, arugula, watercress, cauliflower, bok choy, collards and brussels sprouts. The first research analyzing the high sulforaphane content in mature broccoli was conducted in the 1992 study entitled, "A Major Inducer of Anticarcinogenic Protective Enzymes from Broccoli" and then, in a later 1997 study, the freshly sprouted broccoli seeds were identified as a significantly higher dietary source. The sulforaphane glucosinolates found in the sprouted seeds of broccoli are sulfur-bearing compounds, like MSM, which can be beneficial as an anti-inflammatory aid and also add to its usefulness as a detoxification agent. Glucosinolates produce pungent sulfur-smelling oils also found in many of the other crucifers, like cabbage, horseradish and mustard. They are believed to play a large role in the health increasing effects of this group of vegetables. Broccoli sprouts additionally contain the bioactive agent quercetin, a polyphenol flavonoid that exhibits antioxidant, anti-inflammatory, anticarcinogenic and cardioprotective activities. Both of these phytochemicals, sulforaphane and quercetin, have been shown to be potent substances that possess therapeutic properties beneficial in cancers of the colon, breast, spleen and prostate. How much broccoli or sprouts are needed to produce chemoprotective effects? Some scientific research calculated that one would need to eat an average of 2 lbs of broccoli a week or the equivalent of 1 ounce of sprouted broccoli seeds, 30 times less, to achieve adequate levels of the health promoting phytonutrients. 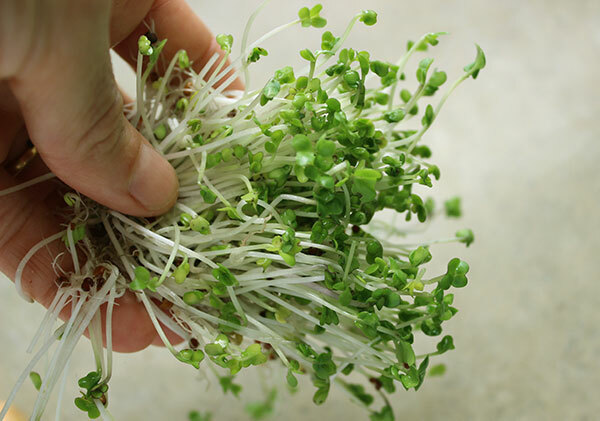 Some health experts believe that it is good to add up to 4-5 ounces of fresh sprouts per week. As mentioned, sulforaphane glucosinolates contain detoxifying enzymes and sulfuric compounds that have been proven helpful for eliminating unwanted pollutants from the body. 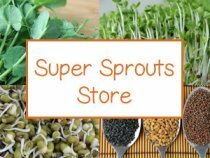 In a 2014 study published in Cancer Prevention Research, it was reported that broccoli sprouts can be an inexpensive way to potentially enhance "the detoxification of some airborne pollutants", lessening risks for related long-term health issues. In this Clinical Trial, close to 300 participants living in areas of China, known for substantial levels of airborne pollutants, were given a beverage made using freeze-dried broccoli sprout powder over a 12 week period. Results indicated detoxification of some airborne pollutants like the carcinogens benzene and acrolein, both produced from car exhaust fumes or the smoke created from burning organic matter or fossil fuel. It was also shown in the same study that sulforaphane may activate a signaling molecule called NRF2 known to increase a cellular adaptative capacity with protective effects against a wide spectrum of environmental toxins. The sulforaphane content in sprouted broccoli seeds when ingested in moderate amounts has shown to have antimicrobial attributes that inhibit Helicobacter pylori, the bacteria believed to cause gastric ulcers and implicated in conditions like leaky gut and IBS. It additionally normalizes DNA methylation and suppresses viral and other disease-related gene expression. Autism, a neurodevelopmental disorder especially prevalent in males, affects the brain's information processing and is characterized by diminished abilities to interact socially with restricted, repetitive behavior patterns. It is widely known that autistic children tend to suffer to a large degree from gastrointestinal dysfunctions with the most extreme cases experiencing the worst GI problems. Current evidence these days supports the commonly accepted belief that autism may be a result of the body's response to a systemic toxic overload as well as an imbalance of intestinal gut flora without the proper ratios of beneficial bacteria needed for maintaining optimal immune response and GI functions. 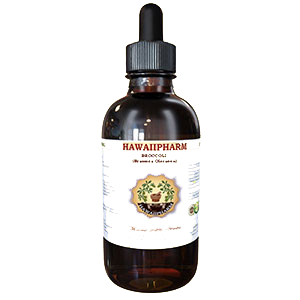 In several studies observing broccoli sprout-derived sulforaphane on autistic symptoms, it was shown to not only inhibit H. pylori but other detrimental intestinal bacteria that tend to dominate healthy strains. 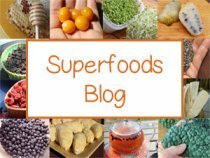 As discussed, sulforaphane also promotes detoxification or the release of stored toxins, a seemingly necessary process for children with autism. 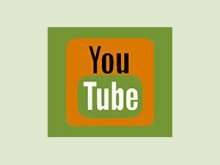 In a 2014 study it was shown that "a significantly greater number of autistic participants receiving sulforaphane had improvement in social interaction, abnormal behavior and verbal communication." While broccoli sprouts and their extracts may be helpful for improving autism or ASD, it might also be appropriate to take other alternative approaches when looking to treat autism through natural dietary means. Specifically, we would recommend the GAPS Nutritional Program by Dr. Natasha Campbell-McBride and the Body Ecology Diet by Donna Gates. Young fresh sprouted broccoli seeds and their glucoraphanin-sulforphane content are also known to decrease the risk of developing cardiovascular problems by helping to reduce associated hypertension and inflammation with cholesterol lowering properties beneficial for conditions like atherosclerosis. Be sure to check out our page on non-cruciferous green leafy vegetables if you have a thyroid disorder and are looking for other options to avoid the potential goitrogen content found in the common brassicas, like kale or collard greens. 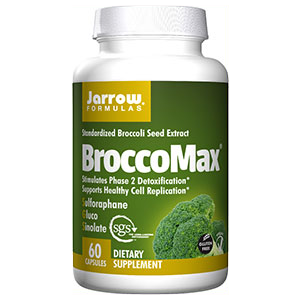 Cruciferous vegetables all come from the family Brassicaceae, and sprouted broccoli seeds are one of them. Crucifers are potentially goitrogenic, containing certain enzymes that may suppress thyroid gland function and interfere with iodine uptake. Consumption is not normally recommended for those with iodine deficiency or an under-active thyroid. This is especially the case when consumed raw in large concentrated quantities, as would be the case when green juicing. However, a number of past and present studies suggest that large portions of cruciferous vegetables added to the diet can significantly help to lower cancer risk, often displaying chemoprotective properties that reduce the body's susceptibility to carcinogens. 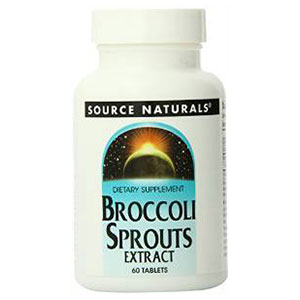 Broccoli sprouts and their concentrated phytonutrients are found to be a more convenient alternative as only a minor portion is needed to get the same protective effects and could thus be a more appropriate dose for those with hypothyroidism. All sprouts contain some degree of phytoestrogens, but typically they are found in higher quantities in alfalfa, clover, pea shoots and fenugreek sprouts. These plant estrogens can be helpful or harmful to the endocrine system depending on one's individual state of health and the amount consumed. Broccoli sprouts are not considerably high in them, compared to these mentioned varieties, but something to be aware of if you are seeking to increase or decrease dietary estrogen. 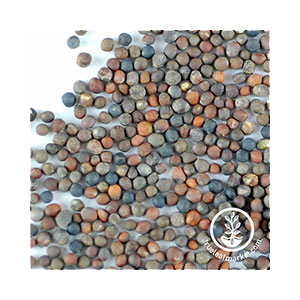 Germinating broccoli seeds is a little bit tricky to do in warmer climates as the broccoli plant is typically a cold weather crop. 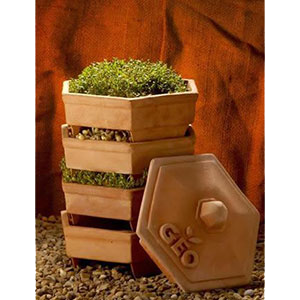 They grow best in spring and fall season or indoors in the winter months. A day time temp of about 70-75°F with cooler night temperatures is most optimal. 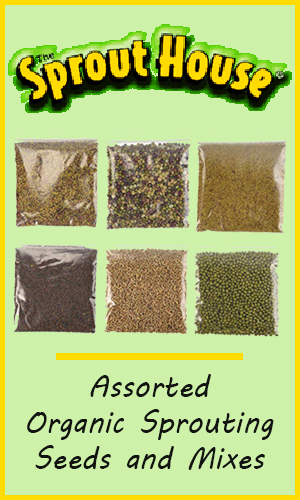 Because of their unique health components, the price of broccoli seeds can sometimes be somewhat high compared to other sprouting seeds. 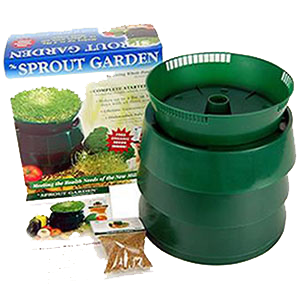 Nevertheless, growing sprouts, generally speaking, is quite low-cost to start, with a tablespoon worth of seeds producing a pound or more of fresh sprouts. Broccoli seeds usually average between 18- 25 dollars a pound, approximately $1 or less per 10" tray of sprouts. Just like growing any other sprout, you must soak your seeds overnight in water. The next day strain the water through a mesh lid and allow the seeds to germinate, with the jar laying at an angle for water drainage. Simply rinse and strain twice daily until they sprout and produce a set of leaves. On the last day, place them by a window and "green" them with sunlight. 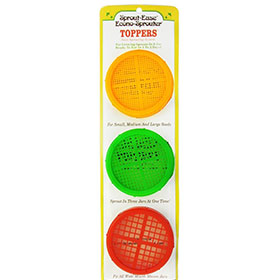 The vertical tray method is one the best ways to sprout broccoli seeds to get beautiful green broccoli sprouts. 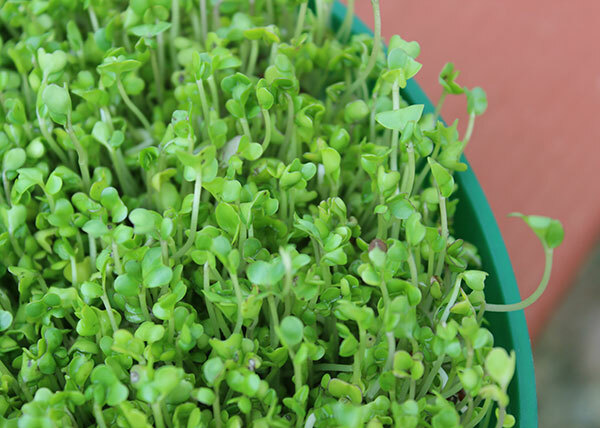 Vertical sprouting involves growing them directly on a sprouting tray (instead of soil) and soaking and draining them once a day in pure water. 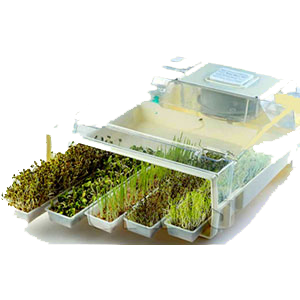 The other option is to sprout them as a microgreen, like wheatgrass, pea shoots or sunflower sprouts, on a soil medium or hydroponic solution. 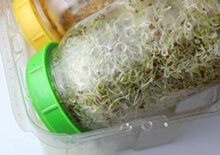 The jar sprouting method works fine for producing sprouts, they are just smaller and may be harder to green. 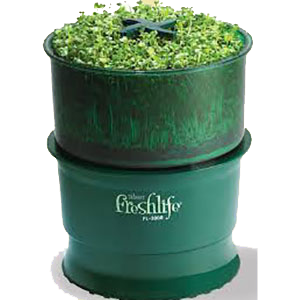 It is definitely the easier more convenient option to vertical and microgreen sprouting which takes longer. Most of the health enhancing components have been shown to be especially present in 5 day old sprouts, before the second set of leaves develop. 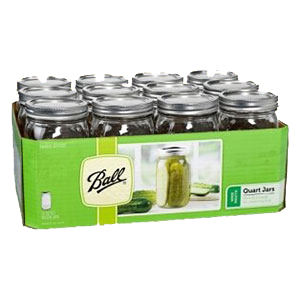 Fresh Sprouts - seeds that are jar or tray sprouted. Sprout Juice - the freshly grown sprouts juiced through a juicer. 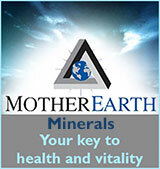 Liquid or Powdered Extracts - typically standardized to contain a ratio of 6% glucosinolates and 0.3% sulforaphane. 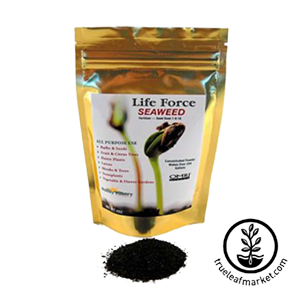 Freeze-dried Powders - potentially contain lesser amounts of bioavailable sulforaphane, but are comprised of beneficial glucosinolates. 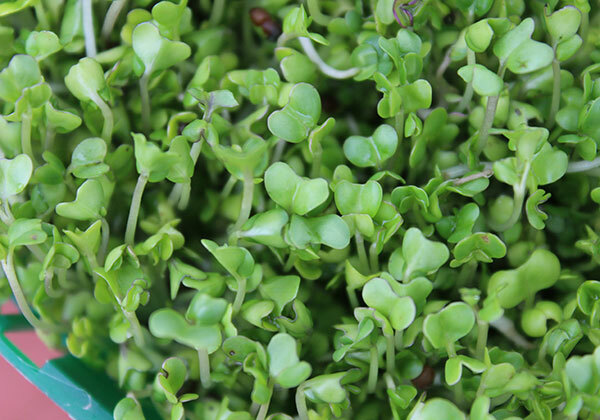 Freshly grown broccoli sprouts are a delicious and tasty addition to green leafy salads or in sprout salads used in combination with other sprouts like mung bean or sunflower greens. They can also be juiced into raw pressed juices to concentrate their health benefits. They are easy to add to nori rolls or veggie wraps and are a great addition as a side sprout with most meals. 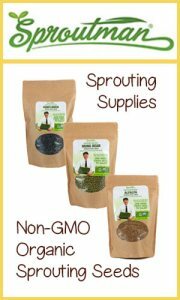 We recommend the sprout extracts over the freeze-dried powder, if you are not a big sprout eater, as they are standardized to contain a specific ratio of glucosinolates and sulforaphane compounds. 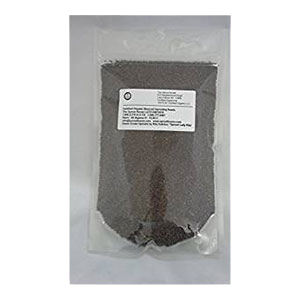 The freeze-dried powders, as we mentioned, are known to have higher amounts of sulfur-rich glucosinolates, but may or may not be able to effectively produce the sulforaphane constituent. 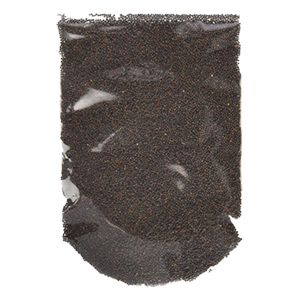 Broccoli sprouts are also available as prepared extracts or freeze-dried powders for those of you who don't like to sprout or don't particularly favor the taste of them. The extracts are usually standardized to include the active constituents at a ratio of 6% glucosinolates and 0.3% sulforaphane. Although the freeze-dried powders are known to have higher amounts of sulfur-rich glucosinolates, there is some controversy about whether the myrosinase enzyme is still present for the efficient break down of glucoraphanin. There is some suspected variability from person to person depending on their own level of intestinal microflora that may aid this conversion process. When broccoli sprouts, or any sprouted seed, is grown inappropriately it can be contaminated with mold, which is especially detrimental to those with mold allergies. 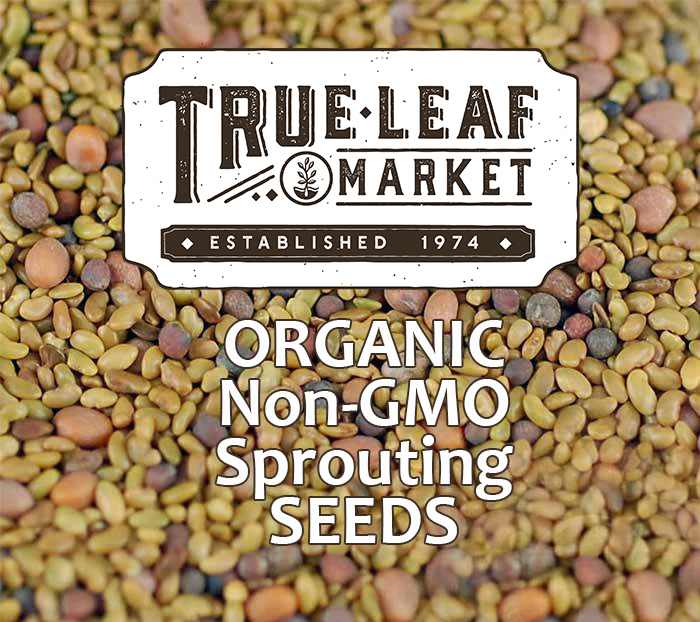 It is important to purchase commercially grown sprouts from a trusted organic source that takes precautionary steps to guard against mold, salmonella and E. coli as there have been some reported cases of sprout contamination. Consult your health care provider if you are taking prescription medications.